SIC Awards - Payroll Software from ZPAY Payroll Systems, Inc.
PayWindow Payroll was nominated and voted as the Best Business Application for 2003 and 2008 and the People's Choice Award for Best Business Application in 2005 and 2009 by the Shareware Industry Awards at the annual Shareware Industry Conferences. Paul Mayer, President of ZPAY Payroll Systems, Inc. proudly accepted the awards and is shown pictured below at the 13th annual awards dinner with Michael (Dr. 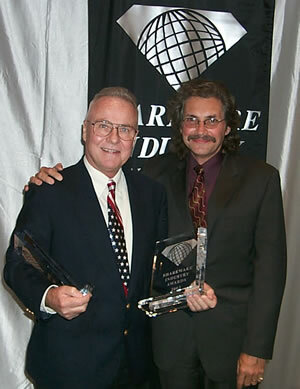 File Finder) Callahan, the founder of the Shareware Industry Awards Foundation. In his acceptance speech, Paul gave a special thanks to his head of the development team who was unable to attend the conference but was with him in spirit and busy back in his office working on new features for PayWindow. The Shareware Industry gathers each year to learn more about Shareware marketing, exchange ideas and network with each other. In addition, the week is culminated by a grand awards banquet where the best of the best is honored.